Seeing Things, the collection’s title poem, featured Heaney’s father Patrick in a make-believe dramatization that brought them ‘face to face’. Heaney revealed how his view of his father changed with age: With the passing of time, awe of the living father has given way to an affectionate acceptance of a fellow man, flawed and mortal like himself (MP217). Heaney dedicates an elegy to his frail old father in decline who, sick though he was, still bore the unmistakable characteristics of the man he was. The poem’s first phrase (He’ll never rise again) offers more than one message: Patrick Heaney is no longer of this world – true; he is bed-ridden – all but true; Heaney no longer believes in any form of afterlife- true as far as we can gauge. Of course Patrick Heaney has risen again within the context of the poem. More exactly Patrick Heaney has survived to live another day (he is ready), responding even in sickness to daybreak that used to herald his daily toil (entered like a mirror by the morning). Confined to his bedroom he has only a big window through which to view the familiar world outside. His mental faculties are in decline: he stares, thinking his own thoughts (wondering), indifferent to weather indicators once useful to the farmer (not caring if the day is bright or cloudy). His sickroom provides an upstairs outlook from which to watch the local world go by: Ulster farming routines carry on regardless (First milk-lorries, first smoke); no change in the landscape (cattle, trees); the same wet climate and lush growth (damp opulence above damp hedges). His vantage point confers elevated status: He has it to himself … like a sentry … forgotten akin to the boy lookout In the Beech (Station Island) and the Mycenae Lookout (Spirit Level) both of them existing alone, posted and forgotten. Unlike them, however, the old man’s dementia leaves him unable to remember the whys and wherefores of his lofty station; just the sense of surviving another night at his post (in position), as free of concern as an incoming wave on the beach: disencumbered as a breaking comber. When seized by moments of panic (his head … light with light) the old man gropes desperately for his stick (ash plant in his grasp), a vital extension of his own body (phantom limb) that helps his physical balance (steadies him), reassures him (found his touch) and restores his will not to give in (stand his ground). Pondering the Aenied’s Golden Bough story, Heaney would clearly love it if Patrick Heaney’s determination (wield) and the magical properties of his walking stick (like a silver bough) opened a way to the land of the living (come walking again among us). 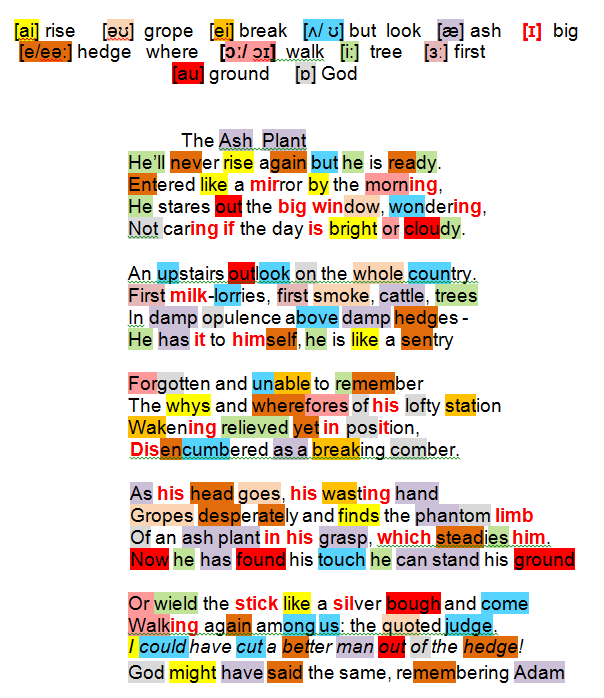 With a rueful smile on his face, Heaney shares his father’s reputation (quoted judge) citing his forthright dismissal of those who did not meet his high expectations: I could have cut a better man out of the hedge (the original source, of course, of his trusty ash plant) and his Old Testament decisiveness – God’s irreversible eviction of sinful Adam from the Garden of Eden. comber: in Ulster usage a wave breaking on the shore.